Sorry, Paris is Closed Today. I have blogged before about the frustrations of getting used to the different hours of opening in Europe. And we have been more aware of that lately, and have tried to plan around it. 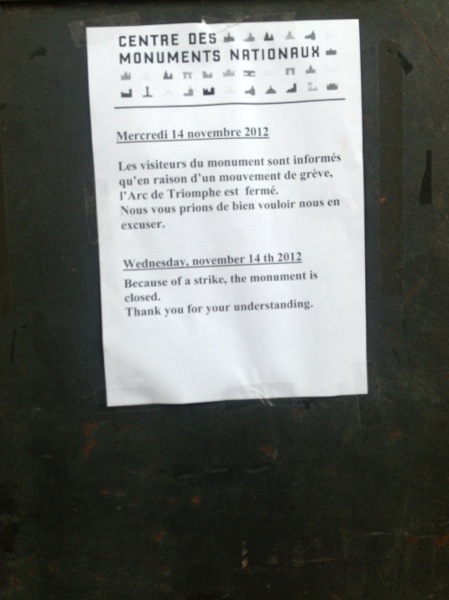 So, some Paris museums are closed on Mondays, others on Tuesdays. The palace at Versailles was closed on Monday. The famous ice cream parlour, as we discovered yesterday, is closed Monday and Tuesday…you get the idea. We thought we had it all figured out, so here was our plan for today. Get up and go to the Catacombs (which we took a few days to get psyched up for, making sure everyone was ok with it, building a little spooky excitement, and all that), then head to an actual destination for lunch (a recommendation from our Paris Guru) to avoid a fiasco like yesterday’s, and then go down to Champs d’Elysee and end up at Arc de Triomphe (and go up it for a great view of twilight Paris). We are excited. My only reservation about the plan is the number of steps it involves – at least another 1000 – because my calves are pretty sore from yesterday’s steps. Part of me is really disappointed, and part of me thinks God is trying to protect me from all the steps. 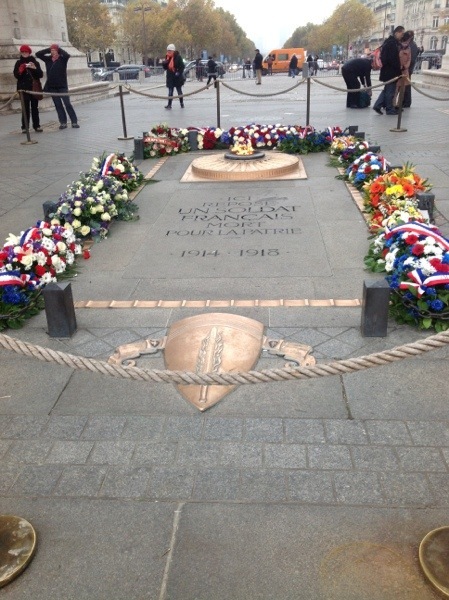 We decide an early lunch is the cure for this, and get back on the Metro for another 16 stops to reach Saint-Denis. 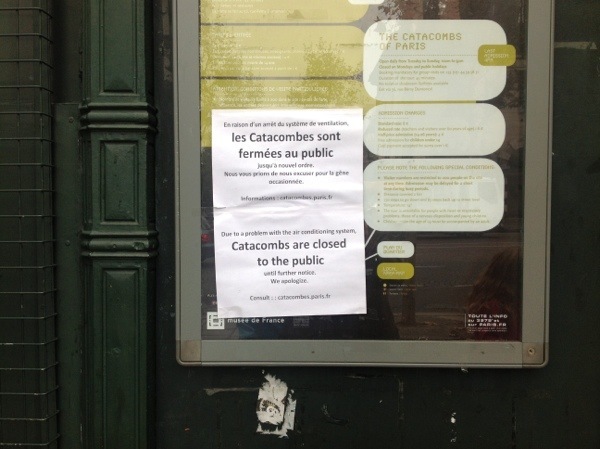 It’s a good thing the Catacombs weren’t open or we would have been having lunch at supper time. It took a while, but we had an interesting walk around the neighborhood. We found it in the end and sat down for a good meal, and tried to get warmed up by drinking a little red wine with it. I don’t think we drank enough, because we were still chilled when we left. OK, it’s off to the next destination. 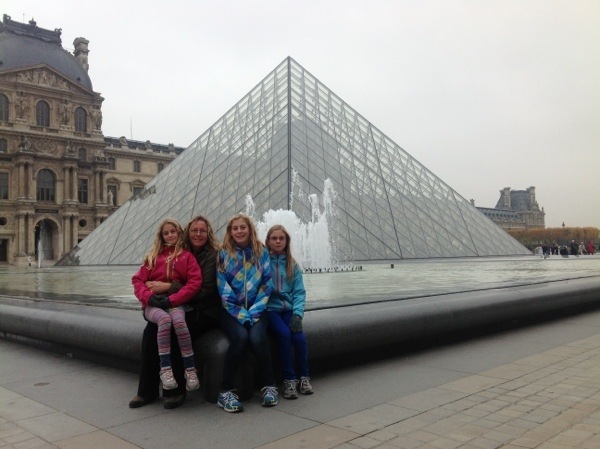 We have a little time to kill, so we decide to walk down to the Louvre and just look at the outside. 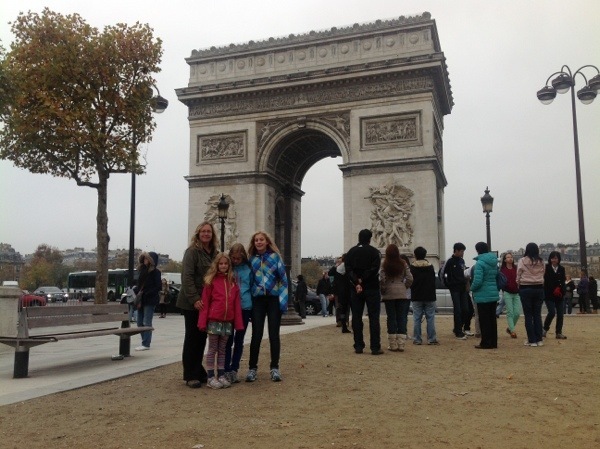 Then we are freezing again, so we hop back on the Metro and get off closer to the Arc de Triomphe. We try to sneak past the Disney Store when we get off the train, but it’s just too bright and inviting in all its Christmas finery, so we have to go in for twenty minutes or so. Not all that cultural, but a fun time for the kids. Out for another walk, and then when we get cold again, we slip into Jack Wolfskin for a bit to feel the warm cozy fleeces and try on hats and mittens as if we intend to buy them. I’m starting to think I may have inadvertently jinxed the day by complaining about my calves, because there goes the other attraction with the many many steps! Someone clearly didn’t think I was up for it! The kids are a little disappointed and we are all really tired, so we get back on the Metro and end our day on our familiar Moulin Rouge corner, do a little souvenir shopping, and grab something for supper. 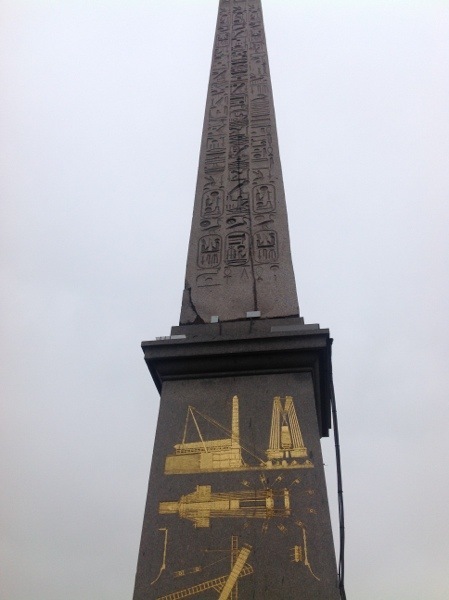 We still had a great day, but it was not quite what we expected, and I think Paris was pretty successful overall. Even Liah didn’t hate it. Most of Europe has been on strike today! That put a snag in the day. Oh well, Mickey Mouse and red wine…all was not lost!! !